How did you spend your Friday night? 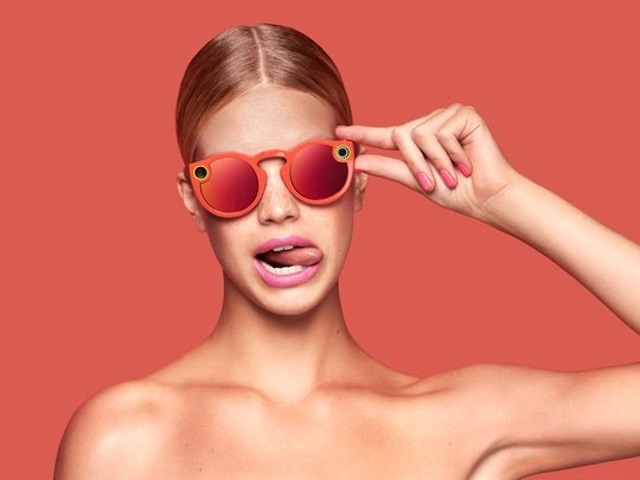 Snapchat spent it changing its company name to Snap Inc. and introducing its Spectacles sunglasses with integrated video cameras. Why the late-Friday-night announcement? A leaked video of Spectacles posted by Business Insider likely accelerated the process. CEO Evan Spiegel broke the news to Seth Stevenson of The Wall Street Journal before the company shared it on its new blog. We’ve been working for the past few years to develop a totally new type of camera. We call it Spectacles! Imagine one of your favorite memories. What if you could go back and see that memory the way you experienced it? That’s why we built Spectacles. We’ve created one of the smallest wireless video cameras in the world, capable of taking a day’s worth of Snaps on a single charge, and we integrated it seamlessly into a fun pair of sunglasses – available in three different colors! Spectacles connect directly to Snapchat via Bluetooth or Wi-Fi and transfer your Memories directly into the application in our brand new circular video format. Circular video plays full screen on any device, in any orientation, and captures the human perspective with a 115-degree field of view. We can’t wait for you to see it! Stevenson reported after Spiegel’s demonstration of Spectacles that the camera records videos of up to 10 seconds “from your first-person vantage” after tapping the button located near the hinge, and each new tap of that button begins another recording. He added that the suggested retail price for Spectacles will be $129.99, and it will be available in black, teal or coral. We’re going to take a slow approach to rolling them out. It’s about us figuring out if it fits into people’s lives and seeing how they like it. It’s not about an accumulation of photos defining who you are. It’s about instant expression and who you are right now. Internet-connected photography is really a reinvention of the camera. And what it does is allow you to share your experience of the world while also seeing everyone else’s experience of the world, everywhere, all the time. It was our first vacation, and we went to Big Sur for a day or two. We were walking through the woods, stepping over logs, looking up at the beautiful trees. And when I got the footage back and watched it, I could see my own memory, through my own eyes—it was unbelievable. It’s one thing to see images of an experience you had, but it’s another thing to have an experience of the experience. It was the closest I’d ever come to feeling like I was there again. It has been five years since (co-founder Bobby Murphy) and I started working on Picaboo, the little app that became Snapchat – and we’ve been so lucky to build an incredible team that has continued to expand upon Snapchat and create products like Stories, Memories, Lenses and so much more! When we were just getting started, it made sense to name our company Snapchat Inc., because Snapchat was our only product! Now that we are developing other products, like Spectacles, we need a name that goes beyond just one product – but doesn’t lose the familiarity and fun of our team and brand.